Bubble Bobble Review: Is This the Cutest Retro Game Ever? Have you ever heard of bubble-breathing dragons? Pop on over to this review and see what you're missing! Bubble Bobble is a charming retro NES game that's worth revisiting. Meet Bub and Bob, two ravenous dragons who defeat every enemy in their path… by blowing bubbles. Who needs fire-breathing dragons, anyway? Controlling Bub and Bob as they trap their enemies in bubbles is just as exciting. 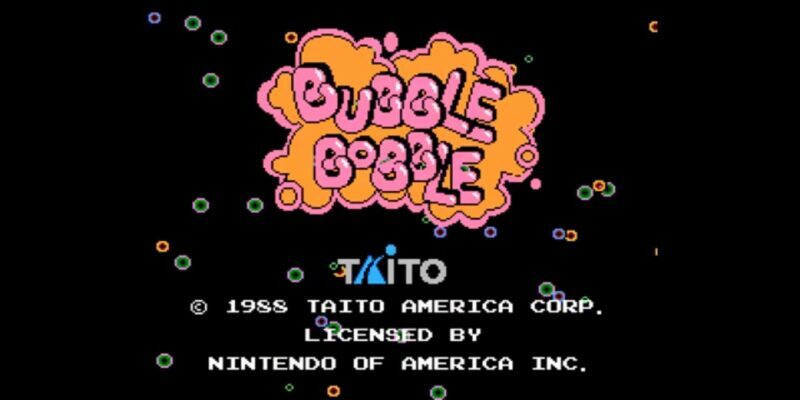 Originally released as an arcade game in 1986, Bubble Bobble later came to the NES in 1988. Bubble Bobble‘s brief storyline, basic controls, and plain environments remind us all of a simpler time. Unlike the scrolling page of text that describes the storyline in The Legend of Zelda, Bubble Bobble allows you to jump right into the game without knowing squat. You don’t really realize exactly what you’re looking for until you defeat the final boss and rescue two female dragons that happen to be Bub and Bob’s girlfriends. We’ll get into this vague storyline a little later. You control Bub, and if you’re joined by a friend, they take on the role of Bob. Sure, you could play Fortnite with your friends too, but Bubble Bobble gives you that classic couch co-op bonding experience that games lack nowadays. Each level looks like a maze—some maps spell out words or form shapes, while others present a complex arrangement of platforms. You can tell that the game designers put a lot of thought into all 100 stages, and use them as a way to express the themes of the game or to provide some helpful tips along the way. Did I mention that it’s impossible to fall off the map? If you slip down a hole, you’ll just come right back out of the top again. You can sometimes use this to your advantage. Enemies fall from the top of the map at the beginning of each level. Shoot bubbles out of Bub or Bob’s mouth to capture them inside. As they float around in a bubble, this buys you some time to trap other enemies as well. Jumping on the bubbles pop them, and eliminate your enemies in the process. Your defeated enemies then turn into blue carcasses, spiral towards the ground and take the form of a fruit. Earn more points by running into the fruits and eating them. Some enemies leave helpful power-ups that cause lightning storms, increase your speed, allow you to breathe fire, and more. The power-ups you receive depend on certain conditions, such as the number and type of bubbles you pop. The game challenges you to finish the levels as fast as humanly possible. If you don’t complete the level in time, the phrase “Hurry up!” will pop up on the screen. This precedes the appearance of the fearsome Baron Von Blubba, a white beluga that resembles a strange-looking ghost. He’ll chase you down until you kill every last enemy. Don’t bother trying to put him in a bubble—Baron Von Blubba is invincible! Once you finish a level, a bubble transports you to the next area. The stages get harder as the game goes on. Some levels require you to climb on bubbles or cope with currents that control the direction and speed of your bubbles. The game doesn’t tell you that Bub and Bob were once humans, which is a pretty big piece of the plot that gets left out. Bub and Bob lived with their girlfriends in a peaceful village. However, once Bub and Bob’s girlfriends, Betty and Patty, got lost in the woods, chaos ensued. The monster, Super Drunk, captured the two girls and held them captive on the 100th floor of his dungeon. When Bub and Bob set out to save them, Super Drunk turned them into bubble dragons, and that’s where the game begins. Wouldn’t it be amazing to watch that story in 8-bit graphics? Maybe the mystery of the story adds to Bubble Bobble‘s charm, but I think an expansion of the plot would give people a reason to play. I’d also like to mention Bubble Bobble‘s graphics. I know you can’t expect much from a game originating in the ’80s, but this game just had a poorer quality of graphics compared to other games released at this time. There’s no comparison between Bubble Bobble and games like Contra or Castlevania—Bubble Bobble lacks details and an entire background. Luckily, the subpar graphics don’t interfere with the gameplay. This game has a very unique soundtrack, namely because there’s only one song on it. Players have a love-hate relationship with this song. It drives some people crazy, while other people could listen to it all day—I’m one of those people who is absolutely addicted to it. You could count its lack of a lengthy soundtrack as a strike against Bubble Bobble, but the music is just too cute and catchy to hate on. If you manage to make it to the end of Bubble Bobble, the ending you get might surprise you, as the game actually has three different conclusions. Reaching the end of the game by yourself will get you sent back to the beginning. That’s right, all of your hard work will get erased because there was no one to rescue poor Patty. However, if you play it with a friend and reach the end, you’ll still get sent back to the beginning—but this time you’ll have a code to unlock Super Mode. In other words, finishing the game in Super Mode is the only way to truly complete it. Complicated much? Bubble Bobble is one of those classic retro games that you keep going back to. Have you ever wanted to know what gives a game its “retro” title? To find out more, check out our article about the elements that make a game retro.